I am a bad blogger. Apologies to my three followers for the long interruption in service. Let’s try one more time to get this show on the road. What have I been doing since I last posted? 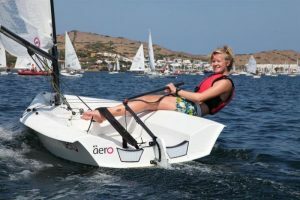 Tillerwoman and I went to Minorca Sailing for two weeks in May and I had a fabulous time, mainly sailing RS Aeros, but I also had one spin in a Laser Radial (for old times sake) and got to try out a Devoti D-Zero. For those not familiar with Minorca Sailing let me refer you to a couple of posts from 2006 on my old blog – Minorca Sailing – 25 Years Later and More on Minorca Sailing. I know they are from 12 years ago but they still capture the essence of what this place is all about, except they have a few newer boats (including the RS Aero) now. Shortly after returning from Minorca I took delivery of a brand new RS Aero from Zim Sailing. The trigger for the purchase was that earlier in the year my son (aka Tiller Extension #1 and Tillerson) had expressed an interest in getting into RS Aero sailing this year. He was talking about buying a second-hand RS Aero, but it seemed to me to make more sense for him to take over my three-year-old boat and for me to buy a new one. 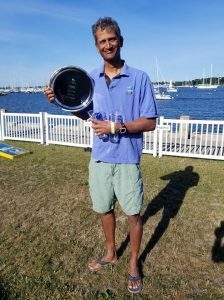 A few days after I picked up the new boat I sailed it in the Small Boat Regatta in early June at our home club Massapoag YC in Massachusetts. 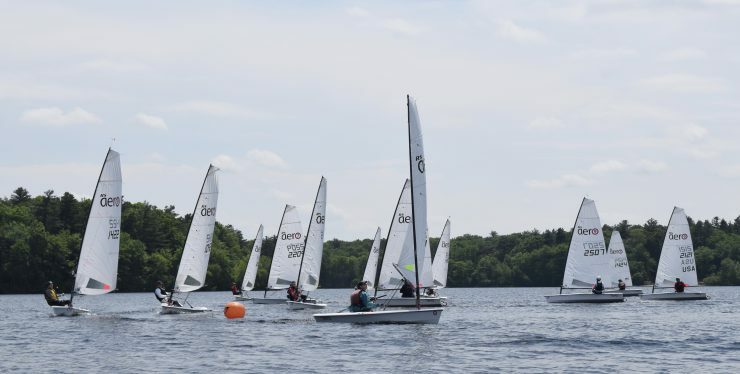 I can’t really remember much about my results in the regatta except my old Aero (sailed by my son) appeared to be faster than my new Aero (sailed by me.) How is that even possible? But what I do remember was that we had 19 RS Aeros at the regatta (along with 14 Sunfish and 11 Lasers.) 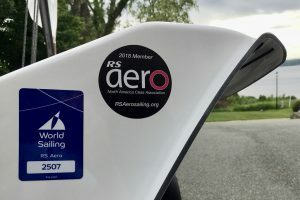 That is a new record for the largest RS Aero regatta in the north-eastern USA. Well done MYC! Can we get over 20 boats next year? I also sailed my RS Aero in the Wickford Regatta in June and the Newport Regatta in July, both of which were predominantly light air events. 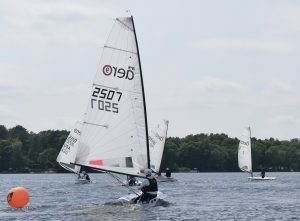 My results in general weren’t much to write home about, but I was third in the final race at Wickford just behind the two sailors who came first and second overall in the regatta, and I also achieved the same thing in one race at Newport. How is it that I can do that occasionally but not more often? As a wise man once said, “You have to be inconsistently good, before you can be consistently good.” I live in hope. Tillerman, this report on your recent sailing is all well and good, but have you ever considered posting about how sailing relates to larger issues in life? Piloting a fragile craft in contrary wind and waves, struggling to avoid a capsize, while battling competitors in a race to succeed could serve as a metaphor for life itself. Imagine the blogging possibilities that might open. And oh, retaining moderated comments might be a good idea. Some commenters seem intent only on disrupting the natural flow of a blog. Hi O Docker – good to hear from you. Well, all mock snarkiness aside, good to see you back at the old stand, or back at the new stand, I guess. Hoping Tillerman 2.0, besides including the usual bug fixes and security improvements, will incorporate some new features while retaining the user interface that made the original such a success. What new features would you like to see? Nothing specific in mind (which is what most of my teachers used to say about me). That’s really for you to explore.